HipCityVeg's newest location is close by City Hall. HipCityVeg, the fast-casual spot serving up a plant-based menu, will open another location this Thursday, Dec. 15. 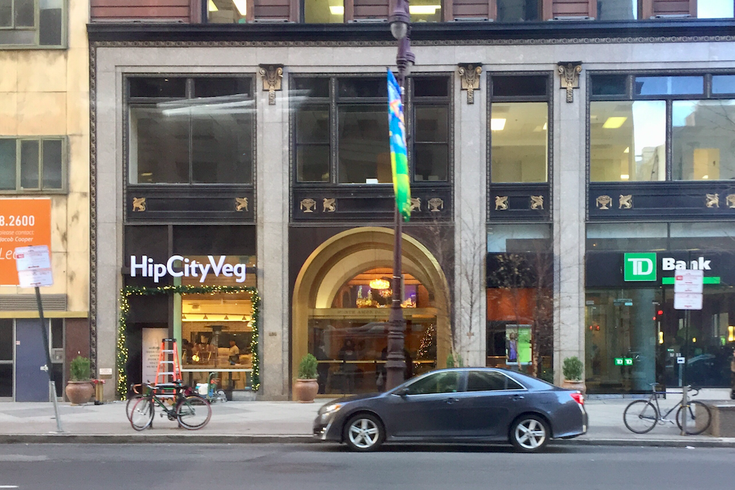 Already, HipCityVeg can be found on 18th Street in Rittenhouse and on 40th Street in University City. The next location to open will be 121 S. Broad St., close to City Hall. To celebrate the grand opening of the new location, HipCityVeg will be giving away sweet potato fries from noon to 1:30 p.m. on Thursday. That's lunch taken care of, but HipCityVeg wants to cook you breakfast, too. A new breakfast menu includes the Lox & Loaded Bagel (made with carrot lox), the HipCity Breakfast Sandwich (with tofu egg and tempeh), the Maple Peanut Butter & Banana Sandwich and La Colombe coffee. HipCityVeg is open from 7 a.m. to 7 p.m. The full menu will be served all day.